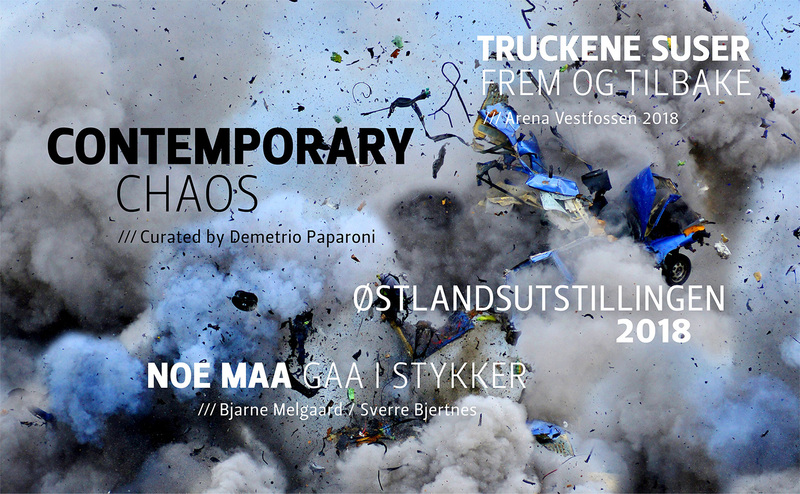 The 16th edition of Vestfossen KunstLaboratorium, at approximately one hour train from Oslo, will be inaugurated on 5th May, at 1:30 p.m. Curated by Demetrio Paparoni, the international exposition ‘Contemporary Chaos’ will present over 60 artists: Ljubodrag Andric (Canada), Paola Angelini (Italy), Ghazaleh Avarzamani (Iran), Nadiah Bamadhaj (Malaysia), Domenico Bianchi (Italy), Andrea Bianconi (Italy), Thomas Braida (Italy), Vanni Cuoghi (Italy), Espen Dietrichson (Norway), Lars Elling (Norway), Sergio Fermariello (Italy), Barnaba Fornasetti/Valeria Manzi (Italy), Letizia Fornasieri (Italy), Giovanni Frangi (Italy), Helgi Þorgils Friðjónsson (Iceland), Daniel & Geo Fuchs (Germany), Daniele Galliano (Italy), Timothy Greenfield-Sanders (USA), Gottfried Helnwein (Austria/Ireland), Paolo Iacchetti (Italy), Liu Jianhua (China), Bree Jonson (Philippines), Tamás Kaszás (Hungary), Ruprecht von Kaufmannaufmann (Germany), Chiara Lecca (Italy), Justin Lim (Malaysia), Sverre Malling (Norway), Masbedo Iacopo Nicolò (Italy), Sebastiano Mauri (Italy), Rafael Megall (Armenia), Alessandro Mendini (Italy), Maria Mulas (Italy), Kristoffer Myskja (Norway), Marco Neri (Italy), Nunzio (Italy) Georg Óskar (Iceland), Tony Oursler (USA), Ruben Pang (Singapore), Francesco Polenghi (Italy), Laurent Reypens (Belgium), Bernardí Roig (Spain), Anne Samat (Malaysia), Nicola Samorì (Italy), Christoph Schirmer (Austria), Andres Serrano (USA), Vibeke Slyngstad (Norway), Doug and Mike Starn (USA), Tjook (Netherlands), Liliane Tomasko (Switzerland), Natee Utarit (Thailand), Ronald Ventura (Philippines), Nicola Verlato (Italy), Luis Vidal (Spain), Wang Guangyi (China), Qingsong Wang (China), Wang Youshen (China), Peter Welz (Germany), Rose Wylie (United Kingdom), Sun Xun (China), Yue Minjun (China). The show wants to emphasise the multiplying of artistic driving forces by focusing the attention on artists coming from all over the world, including areas which once were considered absolutely peripheral. The opening of new markets and the effects of the digital revolution have progressively brought about such an amount of information on art issues and events deemed important, while being often just ephemeral, to thwart every attempt of critical-theoretical grouping. The linguistic chaos deriving from the language superimposition is thus a phenomenon going beyond the overcoming of movements and trends recorded since the Eighties of the 20th century. Contemporary Chaos includes paintings, photographs, videos, performances and great installations. Starting from the premise that finding a unitary tissue in the scene of contemporary art would be absurd both in the West and in the East, the exhibition denies the existence of global linguistic models. Differently from what happened with Modernism, present-day art doesn’t plan the future but analyses the present, focusing on the “here and now.” In the intricacy of languages that Contemporary Chaos takes into account along the four floors of the huge building which was once a cellulose production plant, the remarkable presence of painting, usually marginalised in great international exhibitions, has a great significance beside videos, photos, sculptures and installations. © Copyright 2017 Daniele Galliano. All Rights Reserved.